Can't decide what to give that special someone for Christmas? How about a touch of just about everything! 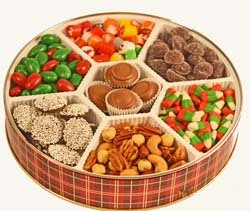 Dorothy's Holiday tin has a touch of those candies which have been the most popular with our customers over the years -- in a quality holiday tin -- great to store your holiday momentos year after year. Please note: Photo depicts red and green jordan almonds. For 2016, this item is replaced with red and green spice drops. Design on tin may vary.